The BSE Sensex closed 463.95 points, or 1.33%, down at 34,315.63, while the Nifty 50 ended 149.50 points, or 1.43%, lower at 10,303.55. 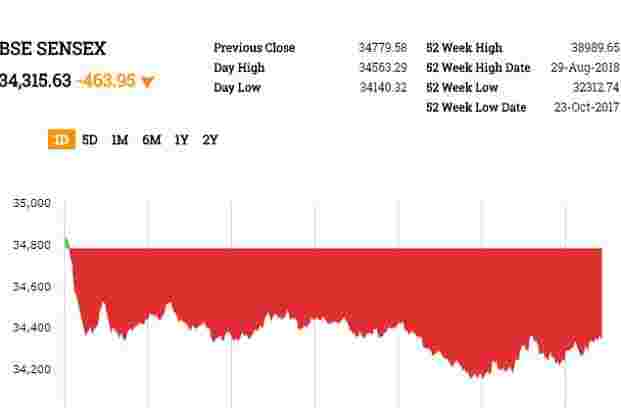 Intraday, the Sensex plunged 639.26 points to 34,140.32, and the Nifty 50 dived 203.45 points to 10,249.60.The BSE MidCap and SmallCap indices fell 1.10% and 1.32%, respectively. 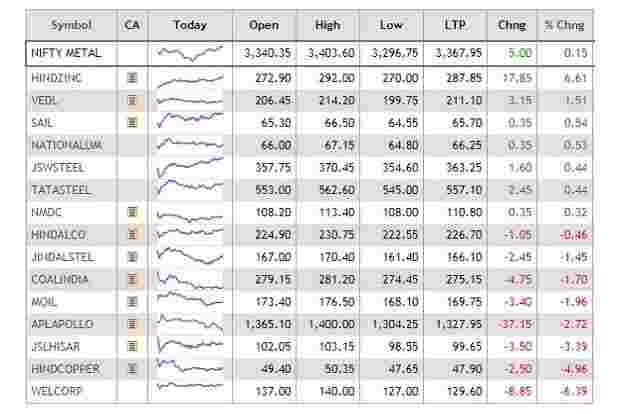 All the sectoral indices on BSE, barring FMCG and metal, declined with energy, IT and teck falling most at over 2%.Sun Pharma, Kotak Bank, HPCL, Vedanta and ITC were among the top gainers on the key indices, whereas Indiabulls Housing Finance, Yes Bank, Reliance Industries, HDFC and Hero MotoCorp led losses.On Tuesday, FIIs sold shares to the tune of Rs 140.02 crore on net basis, while DIIs unloaded shares worth a net of Rs 343.11 crore, provisional data showed. UltraTech Cement’s quarterly profit dropped 9.4 % and missed market expectations, hurt by higher expenses, the company’s statement showed on Friday. Standalone net profit stood at Rs 391 crore for the quarter ended Sept. 30, compared with a profit of Rs 431 crore a year earlier. However, revenue from operations jumped 20.9% to Rs 7,771 crore, while total expenses rose 23.5%. Rising energy and logistics cost coupled with rupee depreciation led to a 14% increase in costs compared to second quarter of fiscal 2018, the company said. UltraTech Cement shares fell as much as 5.39% to Rs 3,529.05 per share. Mphasis reported a net profit of Rs 271 crore in the quarter ended September 30, up 37% from Rs 197.6 core in the year-ago quarter. Total income increased by 19.5% to Rs 1,962.4 crore during the September quarter from Rs 1,642.2 crore in the same quarter last year. Shares fell 4.91% to Rs 1,068. The BSE Sensex slumps 520.99 points, or 1.50%, to 34,258.59, while the Nifty 50 dived 155.65 points, or 1.49%, to 10,297.40. The BSE MidCap and SmallCap indices plunged 1.04% and 1.52%, respectively. Sixteen out of 19 sectoral indices on BSE traded lower with energy falling most at 3.68% followed by realty and IT, which declined over 2%. Telecom, FMCG and metal gained.Sun Pharma, HPCL, Vedanta, Bharti Airtel and Hindustan Unilever were among the major gainers on key indices, whereas Indiabulls Housing Finance, Yes Bank, Reliance Industries, Infosys and Hero MotoCorp were among the top losers. The Reserve Bank Friday announced more measures to increase liquidity flows to the non-banking financial companies. The RBI permitted banks to use government securities equal to their incremental outstanding credit to NBFCs, over and above their outstanding credit to them as on October 19, to be used to meet liquidity coverage ratio requirements. Read moreThe announcement failed to lift NBFC and HFC stocks. Shares of Indiabulls Housing Finance plunged 15.55%, DHFL dived 11%, IIFL Holdings slumped 11.28% and Edelweiss Financial Services fell 7.25%.“RBI directive is a signalling factor that they’re comfortable with banks taking exposure to NBFCs and housing finance companies even at the shorter end,” says Alpesh Mehta, deputy head of research at Motilal Oswal Securities Ltd.Though the RBI directive will facilitate additional liquidity for NBFCs, it might have a different implication for each of them, depending on what their lenders decide,” says Siddharth Purohit, a senior research analyst at SMC Global Securities. ACC shares traded 6.77% down at Rs 1,435.60 per share. Intraday, the stock fell as much as 8.4% to Rs 1,410.05 per share in its biggest intraday percent drop since November 2016. The company posted a 15.7% rise in quarterly profit at Rs 206 crore, which fell short of market estimates as expenses rose. Expenses increased 9.8% to Rs 3,160 crore.Nomura analysts maintained “Buy” rating on the stock with TP of Rs 1,900. “Rising cost inflation remains a key risk to earnings in the near term,” say analysts.Morgan Stanley said cost inflation was largely driven by higher freight and material costs, slag price in particular, while energy costs were flattish notwithstanding sharp rise in fuel costs. MS rated the stock “overweight” with TP of Rs 1,921.Prabhudas Lilladher said, “Due to continuity of intense competition, unabated capacity addition and weakness in high margin Trade segment, we expect prices to remain weak for next couple of years. However, the earnings cut remains limited for ACC at 4% each for CY18e/CY19e supported by lower costs and better regional mix.” The brokerage maintained “buy” with TP of Rs 1,710. Shares of housing finance companies continued their downward trend with Indiabulls Housing Finance falling over 14% and DHFL shares down 11%. PNB Housing Finance slumped 12%, Repco Home Finance was down 7.8%, LIC Housing Finance declined 2.5%, and Bajaj Finance lost 4%.The imminent slowdown in credit growth of non-banking financial companies (NBFCs) could lead to a credit crunch in India, with overall system credit growth falling to less than 10%, Credit Suisse said in a report. In addition, public sector banks are constrained for capital, including 11 banks under prompt corrective action (PCA), and private lenders who have been struggling in mobilisation of deposits with loan-to-deposit ratios (LDRs) in the range of 90-108% for some, said the report. Vakarangee shares fell 5% to Rs 34.20 per share. CNBCTV18 reported that PwC had in April questioned the company’s dealings in bullion and jewellery, and resigned as the company’s auditor for not receiving satisfactory explanation. HDFC Securities said, “We expect GRM to be under pressure due to higher oil prices and lower L-H differential. Petchem business could see some improvement in margins with stabilization of ROGC and Petcoke Gasifiers and commissioning of ethane cracker.” The brokerage maintained “buy” on the stock.Kotak Institutional Equities said, “We reiterate SELL given our concerns on persisting high capex, non-contributing C-WIP and rising debt levels, all of which constrain a sustainable improvement in return ratios and free cash flows in the medium term. The recent deterioration in refining and petchem margins may compound woes in the near term.”IDBI Capital said, “We would wait for stabilization of capex at lower level and growth trajectory of Jio before assigning it a higher valuation.” The brokerage firm has downgraded the stock to Hold and maintained its target price to Rs 1200 a share. “We expect significant monetization of GigaFiber business may take longer than expected time due to last mile connectivity issues. Though strategic investment in Hathway and Den would help speed up the work. Though, pricing pressure in Mobility business may keep ARPU at a lower level in near term,” the brokerage said in a report.Morgan Stanley analysts said cost inflation challenges exist, but could unwind in mid-2019. “What’s next is a key question amid worry that growth kickers are subsiding,” MS added. CIMB believes record capex and rising net debt remain a concern, and that Q3 will see additional capex for the acquisitions of multiple system operators and Reliance Communications Ltd assets. CIMB maintained “reduce” rating with TP of Rs 835.Nomura said the key disappointment was further delays in petcoke gasification. It retains PT of Rs 1,480 with “buy” rating.Of 72 brokerages covering the stock, 26 rate it “buy” or higher, five “hold” and five “sell” or lower; their median PT is Rs 1,282.50, according to the Thomson Reuters data. Mindtree shares plunged as much as 13.15% to Rs 850.20 per share. The company on Wednesday posted a 65.4% rise in consolidated net profit at Rs 206.3 crore for the September quarter compared to a net profit of Rs 124.7 crore in the year-ago period. Its revenues rose 31.8% to Rs 1,755.4 crore in the quarter under review from Rs 1,331.6 crore in the year-ago period.Dolat Capital Market said, “Client specific issues drag overall revenue growth in this quarter, however we expect growth to come back on track in the near term helped by strong demand in the BFSI and retail verticals which remain key for digital adoption.” It has revised EPS estimates by 6.6% and 2.8% for FY20 and FY21, respectively, factoring rupee depreciation. The brokerage maintained “Accumulate” on the stock with a TP of Rs 1,150. Jet Airways shares surged as much as 8.18% to Rs 233.90 per share following news that Tata Sons Ltd has held preliminary discussions to buy a large stake in Jet Airways. Tata has sought management control of Jet Airways, seeking at least 26% initially and another 26% via an open offer later, the Times of India reported on Thursday. The BSE Sensex traded 380.88 points, or 1.10%, lower at 34,398.70, while the Nifty 50 fell 113 points, or 1.08%, to 10,340.05. In early trade, the Sensex fell as much as 491 points to 34,288.25, ana the Nifty 50 plunged 148.45 points to 10,304.60.The BSE MidCap index rose 0.35%, but the SmallCap Index was down 0.43%. Among the sectoral indices on BSE, IT, teck and energy fell most at over 2%. Telecom, utilities and metal led gains. Shares of Reliance Industries fell as much as 6.59% to Rs 1,073.15 after the company posted lower-than-expected September quarter earnings. RIL on Friday said its net profit rose 17.4% to Rs 9,516 crore. Quarterly revenue at the energy-to-telecom conglomerate rose 55% to ₹1.56 trillion from ₹1.10 trillion in the year earlier. RIL’s consolidated net sales were expected to come in at ₹1.41 trillion, according to a Bloomberg poll of seven analysts. Net profit was estimated at ₹9,630.20 crore, according to 10 analyst estimates. The rupee opened marginally lower against the US dollar, tracking losses in local equity markets and Asian currencies. At 9.10am, the home currency was trading at 73.63 a dollar, up 0.18% from its Wednesday’s close of 73.61. The currency opened at 73.62 a dollar. The 10-year gilt yield stood at 7.887% from its previous close of 7.912%. So far this year, the rupee has declined 13.23%, while foreign investors have sold $4.51 billion and $8.61 billion in the equity and debt markets, respectively.